The experienced Portland, Maine car accident attorneys at Hardy, Wolf and Downing have seen the tragic results of distracted driving accidents far too many times in our personal injury practice. As a service to the Maine community, we would like to educate our clients about the dangers of distracted driving in an effort to protect families and save lives. Many parents don’t realize how much of an impact they have on their teen drivers. But research indicates that parental driving habits affect teen driving habits in significant and lasting ways. Our Portland, Maine car accident attorneys want to help you and your family avoid tragic car accidents and the painful personal injuries that often result. Please read the following information about teens and distracted driving, and make it a point to discuss distracted driving with your teenagers. Above all, be a good role model for your kids by avoiding distracted driving yourself. A new study from the University of Michigan Transportation and Research Institute suggests that when it comes to distracted driving, teens have a case of “monkey see, monkey do”. Parents know it’s wrong to tell their children how to be safe, then engage in a risky behavior themselves. But what many parents don’t realize is how strongly they influence their teens’ driving behaviors. When teens witness their parents engaging in distracted driving (e.g. talking on cell phones, texting, applying makeup, using electronic devices, eating), studies show that teens are far more likely to engage in those same behaviors themselves. Lead University of Michigan researcher Ray Bingham, research professor and head of UMTRI’s Young Driver Behavior and Injury Prevention Group, suggests that parents can be a powerful force in their teenaged children’s driving patterns, simply by being good role models. Parents should be very aware what messages they send their children each and every time they get behind the wheel. When parents behave responsibly, it’s more likely that their children will make safe choices when they’re behind the wheel one day. But if parents model poor behavior by talking on cell phones, texting, rummaging around for maps or GPS devices while weaving in and out of traffic, there are serious repercussions. Teens with parents who model distracted driving habits are likely to become distracted drivers themselves. Our Portland, Maine car accident attorneys want parents to remember that it’s not good enough to tell your children about the dangers of distracted driving, then engage in those behaviors yourself. In order to make a real and lasting impact on teens and their driving habits, parents should discuss the dangers of distracted driving and, most importantly, model responsible and safe driving behavior. Interestingly, researchers found that it’s not entirely about what mom and dad are doing behind the wheel when it comes to teens and distracted driving. What teens think their parents are doing behind the wheel affects their driving habits more than what their parents are actually doing! If, for example, your teenager believes their parents become distracted when dealing with passengers, or that they text while driving, their teens are five times more likely to engage in those same distracted driving behaviors. Surprisingly, if a teen actually witnesses a parent engaging in those same distracted driving behaviors, they are only twice as likely to model the behaviors themselves. The attorneys of Hardy, Wolf and Downing want parents to know that what your teen THINKS you are doing behind the wheel is an important factor in their driving behavior. According to researchers, it’s actually MORE important than what you’re actually doing! That means parents must pay careful attention to how they act in front of their teens. They should NEVER allow their teens to see them making poor choices while driving. Modeling distracted driving behavior in front of our kids has the potential to affect them and their driving habits for the rest of their lives. One-third of teens in the study believed their parents used an iPod while driving when in reality only 10 percent of the parents in the study reported using any music device while driving. A whopping seventy-one percent of teens thought their parents read or wrote down directions while driving when only 55 percent of parents admitted to that behavior. For the most part, teens believe their parents are engaging in distracted driving on a regular basis, and this belief affected their driving behaviors whether or not it was actually true. Another major finding from the study is that parents often underestimate whether or not their teen texts while driving. More than a quarter of teens (26 percent) read or send a text message at least once every time they drive, although only 1 percent of their parents said their teen texted while driving. The car accident attorneys at Hardy, Wolf and Downing want you to remember your teen isn’t immune to the dangers of texting and driving. Don’t assume your child is a perfectly safe driver. Take the time to educate them about the dangers of texting while driving, and you may save their life. Parents and teens used cell phones at similar rates (more than half of teens used cell phones while driving and 60 percent of parents used cell phones while driving). Approximately one in ten parents admitted to responding to a text at least once every time they drive. 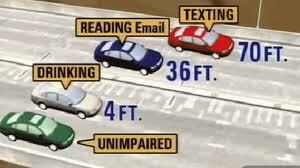 Thirteen percent of parents admitted to reading a text or email while driving. Approximately 25 percent of teens admitted to responding to a text while driving, while 30 percent read a text message at least once every time they drive. Twenty percent of teens and ten percent of parents admit to having extended text conversations while driving. More than 50 percent of teens admit to searching for music on a portable music player while driving. Although passengers pose the biggest distraction risk for teens, teenagers regularly drive with passengers. More than two-thirds of the teenagers in the University of Michigan study reported that they drove with two to three teenaged passengers in their car (without adults). Studies indicate that teen drivers are more likely to be distracted by rowdy, loud passengers than electronic devices (Washington Post). According to UNC’s Center for the Study of Young Drivers, teenaged drives are six times more likely to have to make an evasive maneuver while driving in order to avoid a crash when their passengers are talking loudly, and three times more likely to have almost been in an accident when their passengers are engaged in “horseplay”. A teen who drives with more than 3 young passengers in the car without an adult is four times more likely to die in a car accident. How Much Of A Concern Is Distracted Driving? In 2012, the federal Department of Transportation reported that 3,328 Americans were killed in distracted driving crashes. For teens (aged 15 to 19 years of age) who were involved in fatal distracted driving crashes, 21% were distracted as a result of using cell phones while driving. Distracted driving is a serious issue for drivers of all ages, but is of particular concern for teenaged drivers because research indicates that teens are more likely to be injured or killed in distracted driving crashes. Because teens are less experienced and especially prone to being distracted by their passengers (especially when those passengers are other teens), they are at a substantially higher risk for distracted driving injury accidents and even death. Our Maine attorneys want to see you and your family safe and have gathered the information for adult and teen drivers in an effort to end distracted driving. Only 1 percent of parents believe that their teens text while driving. Yet University of Michigan researchers found at least 26 percent of teens read or sent text messages at least once every time they drove. The attorneys at Hardy, Wolf and Downing want parents and caregivers to remember that children observe your behavior each and every time they get in the car with you. They are remarkably observant, and have extraordinary memories (often for things we wish they’d forget!) Even very young children notice how adults behave when they drive. Kids are storing away memories which they’ll rely on when they become drivers. Vow to set the right example for your children. Keep your eyes on the road at all times. Don’t engage in distracted driving. After all, you’re carrying precious cargo and teaching vital safety lessons every time you hit the road with your little ones (and not so little ones) as passengers. When you are behind the wheel, be very careful not to distract yourself with the following activities. Remind Your Children It’s Never OK To Drive Distracted. Putting on makeup, grooming, styling hair, etc. Kids won’t listen to what they’re being told; if your actions contradict your words, they’ll do what you do, not what you say. When it comes to distracted driving, mom and dad must always practice what they preach. Our experienced Portland, Maine Car Accident Attorneys want you to put away your smartphones while driving. Do your very best to avoid driving distractions. You are your child’s best and most important teacher. When it comes to being a safe, responsible driver, teach them well by being a safe driver yourself! The Maine Car Accident Attorneys at Hardy, Wolf and Downing provide our blog as a service to our clients. They are meant to be purely informational. If you or a loved one has been in an accident or has been involved in a crash as a result of distracted driving and would like a free consultation with a personal injury attorney, please call our firm today at 1-800-INJURED to start understanding your legal rights.